What makes Live Lingua Italian different? Here are just a few of the reasons to study with us at Live Lingua Italian. 1-on-1 Italian lessons online any day of the week. Our Italian teachers have years of experience teaching Spanish to foreigners. All of our Italian tutors online can speak a second language. Native Italian speaking teachers from Italy. Each Italian class lasts for 60 minutes. Total flexibility for Italian classes. Enroll in as many or as few hours as you would like. Here is what some of our hundreds of students have said about their online Italian lessons. "This is fantastic, and also so much fun. I am learning so much Italian and I can have the classes whenever I want. Let me also say that [my Italian tutor] is great. He makes it so that even a difficult student like me can learn. Gratzi!" "Skype Italian lessons, what a great idea. What a great mix of technology and education." 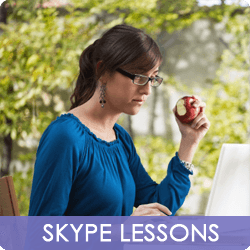 Take a 60 minute trial Skype Italian lesson with one of our Skype Italian teachers. No credit card required. Our Italian teachers have university degrees and years of Italian teaching experience.